The gauges on the right-hand side of this autoclave indicate temperature and pressure. Photo by PHAA Sarna courtesy of US Navy. When monitoring and validation data are required, pressure transmitters are used in autoclaves. 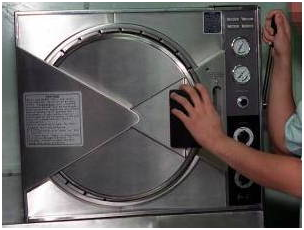 However, in cases where an autoclave is not available, for example, for rural and home sterilization, a domestic pressure cooker can even be used for sterilizing objects such as needles, syringes, and nursing bottles.